Warming up a bit today. 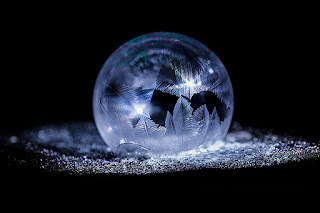 The cold weather was good for something, I was able to try an experiment that a guy I follow on G+ from Canada does, freeze bubbles and take photos. I followed a few tips from him but missed one about back lighting it but I was happy with the results I got. I lit mine from the side and at an angle. I hate the cold weather but this was a fun thing to do. This was from my 3rd and best attempt of the day. I had done some in daylight but I like how this night time version turned out.